An aerial view of the Emirates Stadium and surrounding area including Arsenal's former stadium Highbury, which has since been redeveloped into Highbury Square. The stadium is a four-tiered bowl with roofing over the stands but not over the pitch. The design team included architects HOK Sport (now known as Populous), construction consultants AYH, and engineering firm Buro Happold. The stadium was constructed by Sir Robert McAlpine on the site of Ashburton Grove industrial estate, several hundred yards from Arsenal's former home at Highbury. The upper (26,646) and lower (24,425) tiers of the stadium feature standard seating. For the 2006-07 season, ticket prices for an adult ranged between £32 and £66 for most matches, but were as low as £13 for juniors and Cannon Club members, in the family enclosure only (designated "Category B"), with the price rising for "Category A" matches against certain top sides to between £46 and £94, with around £20 for juniors in the family enclosure. Season ticket prices for 2006-07 ranged between £885 and £1,825. The main middle tier, known as the "Club Level", is premium priced and also includes the director's box. There are 7,139 seats at this level, which are sold on licences lasting from one to four years. The cost of club tier seats for 2006–07 ranges from £2,500 to £4,750 per season and covers admission to all home league games and any home games Arsenal play in the UEFA Champions League, FA Cup and Carling Cup. These were sold out by May 2006. Immediately above the club tier there is a small tier consisting of 150 boxes of 10, 12 and 15 seats. The total number of spectators at this level is 2,222. Box prices start at £65,000 per annum plus VAT, and covers admission to all home league games and any home games Arsenal play in the UEFA Champions League, FA Cup and Carling Cup. The most exclusive area in the stadium is known as the "Diamond Club" which is invitation only and costs £25,000 up front plus £25,000 a year. Tickets here include use of a private lounge, a complimentary restaurant and bar, valet parking and concierge service. Members will also have the option of travelling to European away games on the players' aeroplane. The high demand for tickets, as well as the relative wealth of their London fans, means revenue from premium seating and corporate boxes is nearly as high as the revenue from the entire stadium at Highbury. The pitch is 113 × 76 metres in size, making it the joint-largest pitch in the Premier League, while the total grassed area is 113 × 76 metres. It runs north-south like at Highbury, with the players' tunnel and the dugouts on the west side of the pitch underneath the main TV camera. The away fans are found in the south-east corner of the lower tier. The away supporter configuration can be expanded from 1,500 seats to 4,500 seats behind the south goal in the lower tier, and a further 4,500 seats can be made available also in the upper tier, bringing the total to 9,000 supporters (the regulation 15% required for domestic cup competitions such as the FA Cup and Carling Cup). The upper tier is contoured to leave open space in the corners of the ground, and the roof is significantly canted inwards. Both of these features are meant to provide as much airflow and sunlight to the pitch as possible. Arsenal have a reputation for having one of the best playing surfaces in the world, and the design of the new stadium took this into account. This does have the effect that supporters in the upper tier on one side of the ground are unable to see supporters in the upper tier opposite. In the north-west and south-east corners of the stadium are two giant screens suspended from the roof. The club are currently in the process of examining whether to add a third giant screen in the north-east corner of the stadium. The new stadium pays tribute to Arsenal's former home, Highbury. The club's offices are officially called Highbury House, located north-east of Emirates Stadium, and house the bust of Herbert Chapman that used to reside at Highbury. Three other busts that used to reside at Highbury of Claude Ferrier (architect of Highbury's East stand), Denis Hill-Wood (Former Arsenal chairman and father of current chairman Peter Hill-Wood) and Arsène Wenger (current Arsenal manager) have also been moved to Emirates Stadium but they are currently in storage. Additionally, the two bridges over the railway line to the east of the stadium, connecting the stadium to Drayton Park, are called the Clock End and North Bank bridges, after the stands at Highbury; the clock that gave its name to the old Clock End has been resited on the exterior of Emirates Stadium facing the bridge of the same name. After pressure from fans, the Club has decided to resite the clock inside the stadium, this will happen in the summer of 2010. The Arsenal club museum, which was formerly held in the North Bank Stand, opened in October 2006 and is located to the north of the stadium, within the Northern Triangle building. 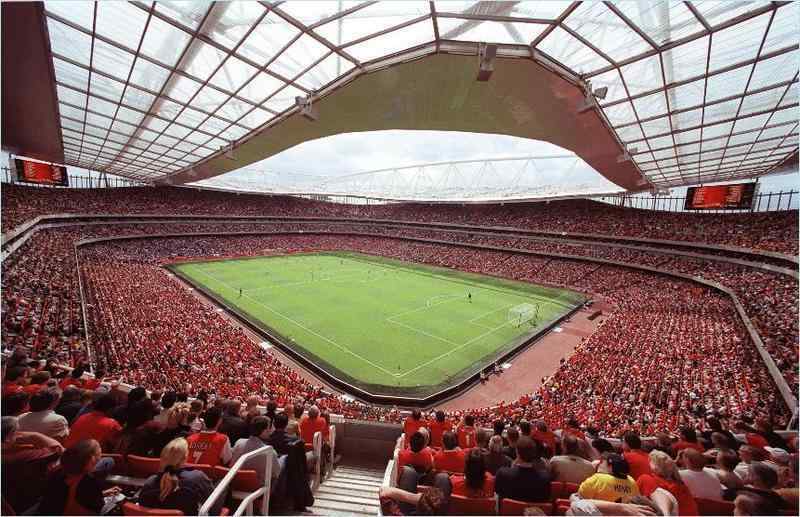 VIDEO - How was Arsenal Stadium built ? Club and Box level opens two and a half hours before kick off and the lower and upper levels open two hours before kick off. This is our aim but due to a number of reasons we cannot always achieve this. Getting to Emirates Stadium is simple. London's comprehensive public transport network will take you within a few minutes walk of the ground and clearly located signs will help pedestrians find their way from stations or bus stops. The stadium has a colour coding system to signify different areas. Please note visiting spectators are located in the green quadrant, to the south east of the stadium. A summary of your travel options is set out below or you can plan your best route by public transport using our Journey Planner. For your first few visits, please be patient and pay attention to the advice given by stewards and the police. Take your time to find your way around, plan ahead and try to arrive early and leave later - so you can enjoy the extensive new, high quality facilities including our new matchday television show. Arsenal (Piccadilly Line) is the nearest tube station, around three minutes walk from the ground. Finsbury Park (Victoria, Piccadilly Lines and Great Northern rail) and Highbury & Islington (Victoria Line, North London Line and Great Northern rail) stations are around a 10-minute walk - these should be slightly less crowded. King's Cross is the main connecting station for national rail and many underground lines. From here you can travel to the ground via the Piccadilly Line (to Arsenal) or the Victoria Line (to Highbury & Islington). Alternatively, a short overground rail journey of one stop will take you to Finsbury Park station. Please note: Holloway Road station will be exit-only before and after matches with pre match eastbound trains non-stopping. Drayton Park is also closed on match days. To ensure safe entry and exit from local stations, a managed queuing system will be in place. Queuing will be outside on Gillespie Road. Queuing will be outside on Seven Sisters Road/Isledon Road and St Thomas's Road/Rock Street. Queuing will be on the south side of Holloway Road. Spectators are advised to follow the route down Holloway Road as no direct access to the station or queuing system will be available from Highbury Fields. Closed to pedestrians, emergency access only. Police controlled crossing point where supporters will be queued and assisted across Holloway Road as quickly as possible. Bus is a fast and convenient option with connections passing the ground on all sides. Main bus stops are located on Holloway Road, Nag's Head, Seven Sisters Road, Blackstock Road and Highbury Corner. High frequency services will take you within a five to 10 minute walk of the ground and direct routes cover much of north and central London. Further information on buses is available through www.tfl.gov.uk or consult the maps of local bus routes below. Arsenal Football Club would like to set out their arrangements for supporter coach travel to Emirates Stadium. Queensland Road is the coach parking site for Emirates Stadium. Supporters will only have to walk a few moments to reach the stadium. Please note that minibuses are not permitted to park at the designated coach parking site. To ensure the operation of Emirates Stadium runs as smoothly as possible for spectators, local residents and businesses, Arsenal Football Club has introduced a booking procedure for supporter coach travel. If you do not follow the simple three step procedure your coach will not be able to park at Emirates Stadium. Your Club / Coach Company must register with Arsenal Football Club if they intend to travel to Emirates Stadium by coach, by completing the attached form at least 7 days before a match. This simple registration form asks for coach and travel information (e.g. departure time, number of passengers, on-coach contact). When the registration form has been received Arsenal Football Club will e-mail each Club a coach identification permit along with directions on how to get to Emirates Stadium. Coaches must display their identification permit in the front windscreen and arrive between 4 and 2 hours before the start of the match. All access routes to the Queensland Road coach parking site will be closed by the Metropolitan Police Service 2 hours before the start of a match. Late arriving coaches will not be permitted into the area and will not be allocated a parking space. Specific parking instructions will be e-mailed back once this information has been received. If you have any questions about the coach parking arrangements please contact the e-mail address above. Arsenal Football Club would like to thank you for your cooperation and we wish you a safe journey to and from Emirates Stadium. Supporters are strongly advised not to drive to Emirates Stadium. The ground is situated in a mainly residential area with an extensive Event Day Parking Scheme in operation. Only car owners with resident's permits will be allowed to park on-street in the designated areas and any cars parked illegally will be towed away. In light of the club’s forthcoming move to Emirates there will be a number of changes to the traffic plans on days when matches are played. This is so the Metropolitan Police Service can safely manage travel to and from the stadium and reduce inconvenience, as far as possible, to people living nearby. For more information about these traffic changes then please visit the Islington Council website. For details of the CPZ operation, times and permit applications visit: www.islington.gov.uk/matchdayparking. Please contact Islington Council with any queries: 020 7527 2000 or contact@islington.gov.uk. Cycling is easier than you think. It is a quick and healthy way to make your journey and saves you a lot of money. Why not avoid the crowds and queues by cycling to the stadium? Emirates Stadium is fully accessible by bicycle. There are a number of cycle routes through the area, and as Islington is a small, relatively flat borough, it’s a great way of getting to the stadium. Routes across London are mapped out on Transport for London's London Cycle Guides, a collection of 19 maps covering the whole of London. You can obtain a cycle guide by logging-on to: www.tfl.gov.uk/cycles. Or plan you journey from your home to Emirates Stadium on Transport for London's online journey planner. Remember to tick the 'cycle only' option. Once you arrive at Emirates Stadium there is secure cycling parking available close to the ‘All Arsenal’ retail store on Drayton Park. The cycle parking area is clearly signposted, but Arsenal stewards will be on hand to assist. Other cycle parking facilities in the area can be located by logging on to Islington Borough Council’s official website: www.islington.gov.uk/transport/cycling/cycleparking. There is a secure (locked) cycle parking site at Finsbury Park Station which is detailed at the following link on TfL’s official website: http://www.tfl.gov.uk/roadusers/cycling/978.aspx. Access costs 50p per day. Food within reason is allowed into the Stadium. Soft drinks in small plastic bottles and flasks are also allowed. Aluminium cans and alcohol are NOT allowed into the Stadium. Tap water is freely available from the concessions . Please queue in the normal way and on request you will be given a plastic cup of water. Buggies are allowed into the Stadium. On arrival at the turnstile please contact the nearest steward and they will arrange to store the buggy in one of the kiosks. If you require any advice with regards to drop off and pick up points please contact the Stadium Management department on 020 7704 4030 or stadium@arsenal.co.uk Monday to Friday between 9am to 5pm. I would like to inform you of the coach parking arrangements for the forthcoming Arsenal v Burnley FA Cup 5th Round match on Sunday 8th March 2009, Kick Off 1.30pm. It is anticipated that there will be an increased number of coaches travelling from Burnley to Emirates Stadium on Sunday 8th March 2009. As with normal match days, Queensland Road and the Sobell Centre (both off-street parking) will be used to park supporters’ coaches. However, in order to facilitate the extra number of coaches, we have agreed with both Islington Council and the Metropolitan Police that Hornsey Street will also be required to be used on Sunday 8th March 2009. The location will be the north (By Tesco Metro/FitSpace Gym) side of Hornsey Street – up to 13 coaches. The coaches are predicted to arrive between 2 - 4 hours before kick-off (i.e. between 9.30am and 11.30am) and they will leave Hornsey Street within one hour after the final whistle which will be at approximately 3.30pm. Arsenal FC stewards will be deployed at Hornsey Street from 9.30am onwards to advise drivers to switch off their engines and air conditioning, direct spectators to the stadium and to assist the coaches into the parking spaces. Stewards will remain with the coaches until they depart ensuring the engines and air conditioning are switched off to minimise the impact on residents and businesses. There will also be a Police presence on the spectator route between Hornsey Street and Emirates Stadium before and after the match. The parking bays will therefore be suspended for the whole day. Please note that if a vehicle is parked in a suspended parking bay on a match day it can be subject to Penalty Charge Notice (PCN) and may be towed away to the nearest side street. In the unlikely event that your vehicle has been relocated please contact TRACE on 020 7747 4747 for its location. We strongly advise that you check the parking signs on-street before you park any vehicle in the area. You can also call the new Arsenal FC match and event recorded information: 0844 931 22 11. Your assistance in this matter is greatly appreciated and once again apologies for any inconvenience this may cause. 1. What are the opening times of Arsenal Stadium ? Ans : Please click here to find out the opening times of Arsenal Stadium. 2. What are the family enclosure rules in the Arsenal Stadium ? The Family Enclosure is restricted to members only. All membership cards MUST be shown to an Arsenal member of staff/stewards if requested. Other photographic identification and evidence of your date of birth may also be requested. Gold adult members can only use this area of the stadium if accompanying a Gold Junior Gunner at a ratio of 2 Adults per Junior Gunner. If an adult Gold member wishes to attend a match in the Family Enclosure without a Junior Gunner being present, he/she needs to contact the Arsenal Contact Centre on 0207 619 5000 for advice on the correct procedure. It is very important to make contact with the Club prior to the date of the fixture as failure to do so may result in card confiscation or ejection from the stadium. We regret that we are unable to deal with any requests or enquiries of this nature on the day of the fixture. Concession Season Tickets cannot be used by adults. Junior Gunners from birth to sixteen (you must be sixteen by the 31st August of that season). Cannon Club from seventeen to eighteen (you must be eighteen by the 31st August of that season). Senior Citizens from sixty five or over from the 31st August of that season. Silver and Red adult members can only use this area of the stadium if accompanying a Junior Gunner at a ratio of 2 Adult members per Junior Gunner. Tickets for this area can be purchased through www.arsenal.com/membership or by calling 0207 619 5000 subject to availability and time scales. Junior Gunners, Cannon Club and Senior Citizen members can only purchase tickets outside The Family Enclosure once this area is sold out online through www.arsenal.com/membership or by calling 0884 ARSENAL (0884 2773625). These tickets will be charged at full price and can only be used by the concessions member. Senior Citizens and Cannon Club members can only purchase tickets in the Family Enclosure for themselves, or within a group containing Silver and Red members who are accompanying Junior Gunners. If a concession member cannot attend a match, a refund will be given by the Box Office up to and including seven days before the fixture. Please note under no circumstances may an adult use a concession ticket. For advice please contact the Arsenal Contact Centre on 0207 619 5000 for the correct procedure. It is very important to make contact with the Club prior to the date of the fixture as failure to do so may result in card confiscation or ejection from the stadium. We regret that we are unable to deal with any requests or enquiries of this nature on the day of the fixture. 3. Shopping in Armoury, All Arsenal, Finsbury Park, Enfield in Arsenal Stadium ? With Arsenal's move to Emirates Stadium, the Club's retail business has also moved into a new era. The Club's flagship store The Armoury, located below the podium at the west side / Holloway Road side of the stadium, is now open. Retail guru George Davies, the man behind the rise of Next, George at Asda, Per Una at Marks and Spencer has played a major role in redefining the Arsenal retail experience. Davies believes The Armoury has the most advanced design of any football retail space in the world. He said 'It will take something special to compete with the high street but I'm confident that Emirates Stadium will become a destination retail place'. In addition to The Armoury, a second, smaller shop called the 'All Arsenal' situated at the base of the North Bridge building at the north east side of Emirates Stadium is also now open, it includes a supporter services centre where stadium tours, membership and other Club services can be booked. Arsenal Football Club is also delighted to announce that Enfield will host the latest of its club stores, opening Thursday 25th June at Unit 9, No 31, Palace Gardens Shopping Centre. With a wide range of Arsenal merchandise the shop is a must visit for any fan, and will stock the new Arsenal away shirt launched the day the shop opens. Times may vary on matchdays. 4. What is the contact number of Emirates Stadium ? Ans : Please click here to find out all the contact details of the Emirates Stadium.